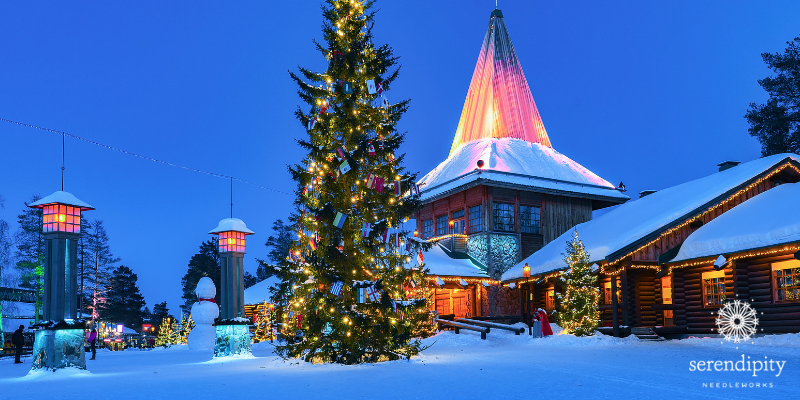 Rovaniemi is in Lapland, the northernmost region of Finland. 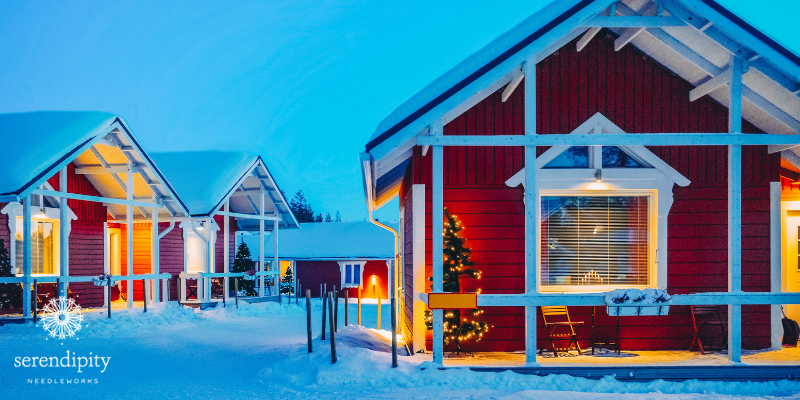 It’s right on the Arctic Circle and it’s – are you ready? He’s had a busy holiday season, too. In fact, he just made it back home last week. 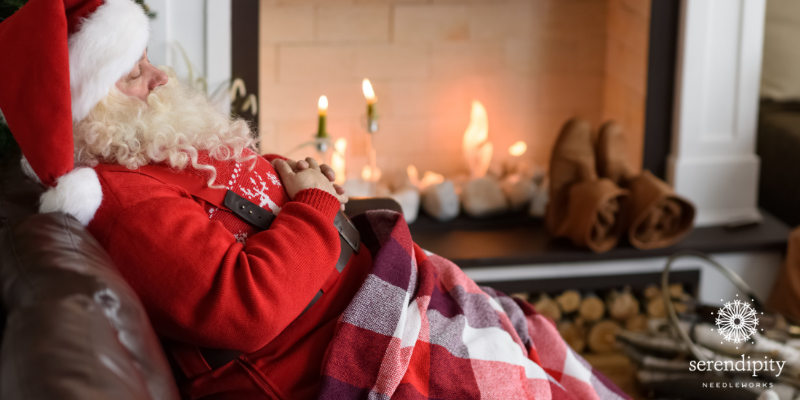 You see, Christmas is celebrated on January 7 in Eastern Orthodox churches, due to the differences between the Gregorian calendar and the Julian calendar. The Gregorian calendar is the international civil calendar – the one we use today. But the Julian calendar is still used by Eastern Orthodox churches to calculate the dates of movable feasts. 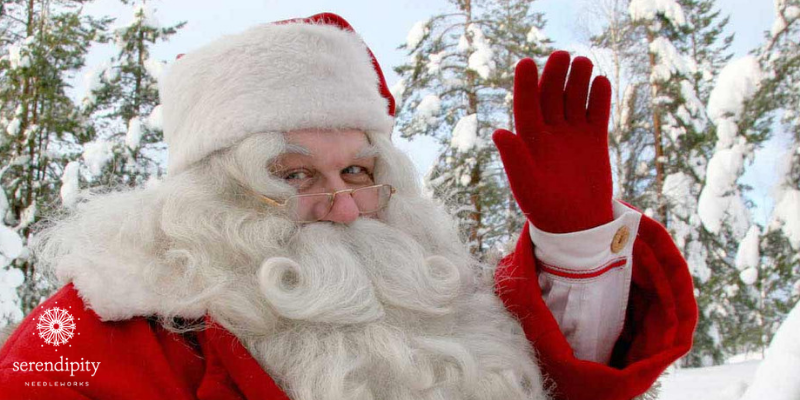 The difference between the two calendars is 13 days, hence Christmas being celebrated on January 7 in many Eastern European countries and Russia. Our stitch this week, the Greek stitch, is a great choice for Santa Claus’s sash. You might find some books and stitch guides that label this stitch as the long-legged cross and it is, indeed a cross stitch. 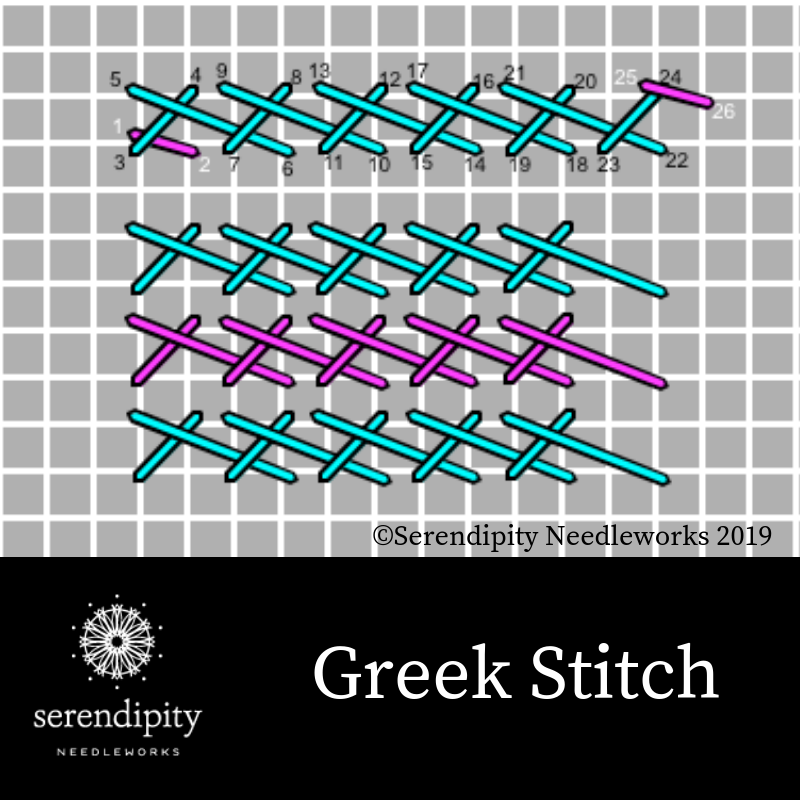 The Greek stitch isn’t hard to execute, but you definitely need to keep an eye on your stitch diagram to keep your place. Notice the little pink stitch in the diagram below? That’s the compensating stitch that gets you in position to begin a row of Greek stitch. The Greek stitch is comprised of a short stitch and a long stitch. Work the short stitch over two canvas threads and the long stitch over four canvas threads, just like you see in the diagram. Oh – and notice that both the short and the long stitch are just two canvas threads tall. The pink stitch on the right side of the stitch diagram illustrates another compensating stitch that shows how to end the row. And below the single row of Greek stitch, you can see how multiple rows of Greek stitch should line up if you use them for a design element like Santa Claus’s sash or belt. You can work the Greek stitch in horizontal or vertical rows. It’s a medium size stitch, so it’ll require a fair amount of space to establish the pattern if you work multiple rows to use it as a filling stitch. A single row of Greek stitch doesn’t take up much space at all and that makes it a terrific option for a border. I’m using Splendor to work this stitch. Now, back to our Greek stitch and Splendor thread – I’m using six strands of Splendor (S800) in a #22 tapestry needle to work my stitch sample on a piece of 13 mesh needlepoint canvas. I recommend that you use a laying tool to lay your threads smoothly on the surface of your canvas. WOW! Can you believe that we’re already to the end of our stay in Finland? I’ve had oodles of fun sharing this fun stitch/thread combination with you. But before you go, be sure and tell me how you might use the Greek stitch on one of your needlepoint canvases. Do you have a particular project in mind? When you leave your thoughts down below in the comments box, I’ll enter your name into a drawing for a free Passenger Passport. Wondering what a Passenger Passport is? 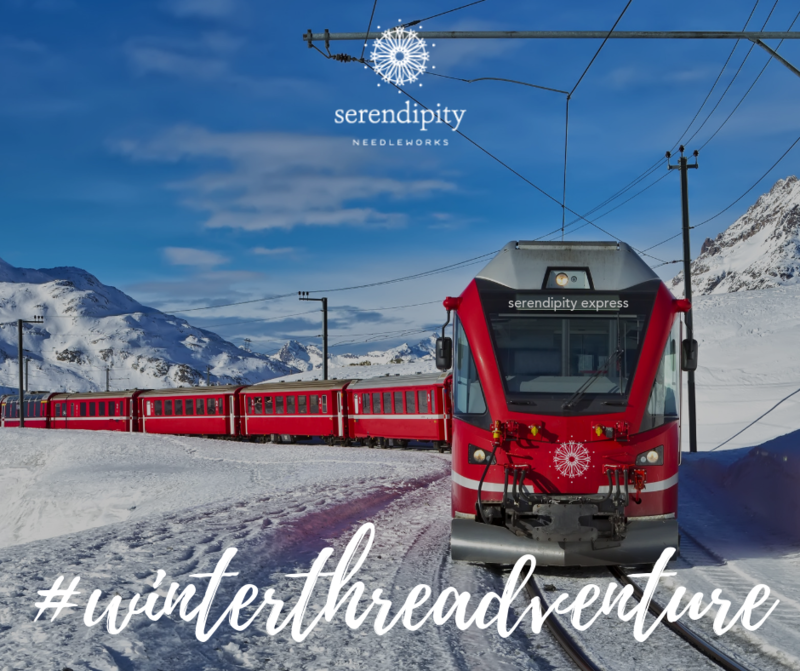 Well, it’s your ticket for full access to all of the goodies over inside the 2019 Winter Threadventure Passenger Portal. I’m sharing at least 4 stitch and thread combinations each week and we have a weekly gathering inside the private Facebook group, too. All of the live sessions are recorded so you can watch them later and you have lifetime access to everything! Not sure what you’ll get with the full experience? Click here to find out more. And remember, it’s never too late to join us. 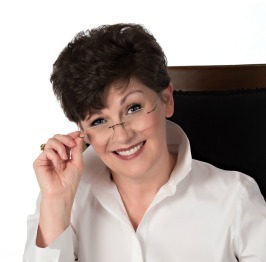 Click here if you want to sign up to get all the Winter Threadventure stitches.